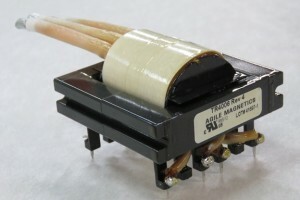 Resonant Converter Transformers - Agile Magnetics, Inc.
Customers from all different industries rely on Agile Magnetics to deliver premium quality standard and custom transformers. Our custom Resonant Converter transformers are constructed with the highest levels of precision and deliver the industry’s top performance. To reduce the size of power supplies, switching losses of the transistors in the circuit must be reduced at higher frequencies. This can be achieved by using a Resonant Converter Transformer with the associated LC circuit. Our design engineers use many of the newest ferrite materials designed to minimize losses at higher frequencies, so our Resonant Converter Transformers can operate up to the 1MHz range. Whether customers need to purchase standard transformers, improve existing custom designs, or create new plans, our team of engineers is up to the task. After consulting with customers to determine whether Resonant Converter Transformers are the best option for their application, we stay with them every step of the way—from design to prototyping to full scale production. With our 40,000 square foot manufacturing center, we can take on projects of virtually any size, scope, or complexity. We guarantee industry-leading quality assurance with our ISO 9001 compliance and ability to manufacture to UL, CUL, VDE, and CE. To learn more about our custom Resonant Converter Transformers, please contact us today.